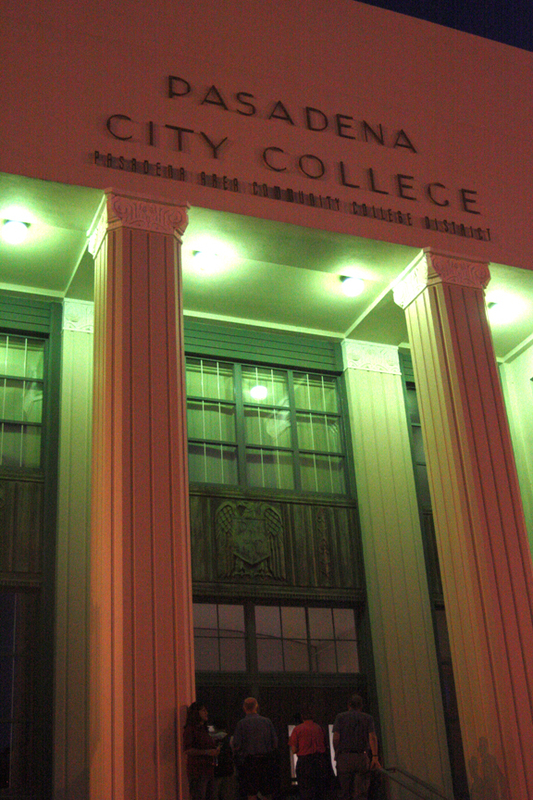 Entrance to the auditorium building at Pasadena City College. The following are my notes from the landing of the Curiosity rover on Mars as it happened. You know by now how it all ended. But I hope I’ve captured my feelings and impressions as Curiosity came down; I hope you’ll be able to feel the same suspense and awe that I did. Trying to do three things at once, I knew I wouldn’t be able to type on a computer, hold a video camera, and take still photos at the same time while sitting in a small seat in a darkened auditorium. So I balanced my notebook on my right knee while jotting down a few notes here and there, held the video camera in my left hand on record (hopefully I wasn’t too shaky with it), and grabbed a few still shots with my right as often as I was able throughout the program. 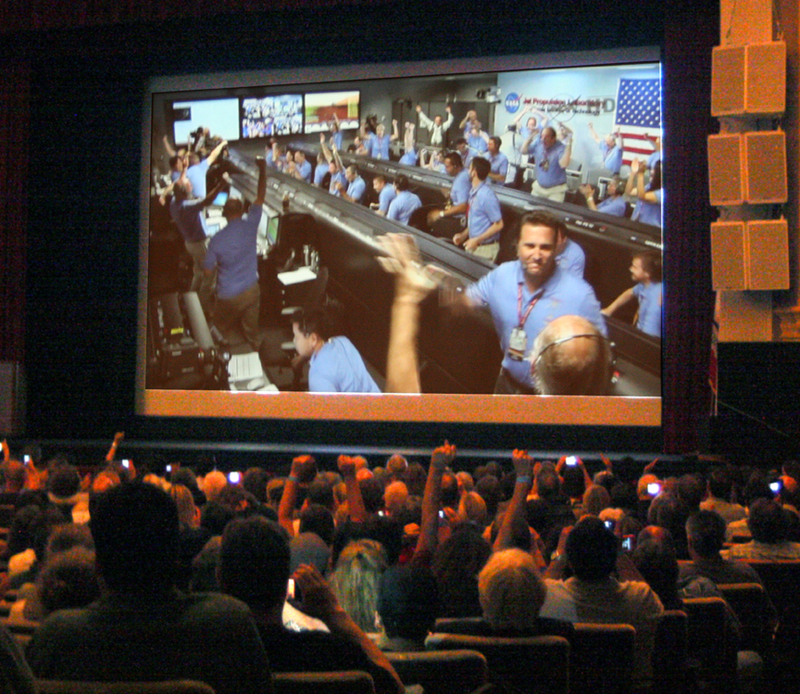 Auditorium at Pasadena City College, site of the family and JPL employee landing event. 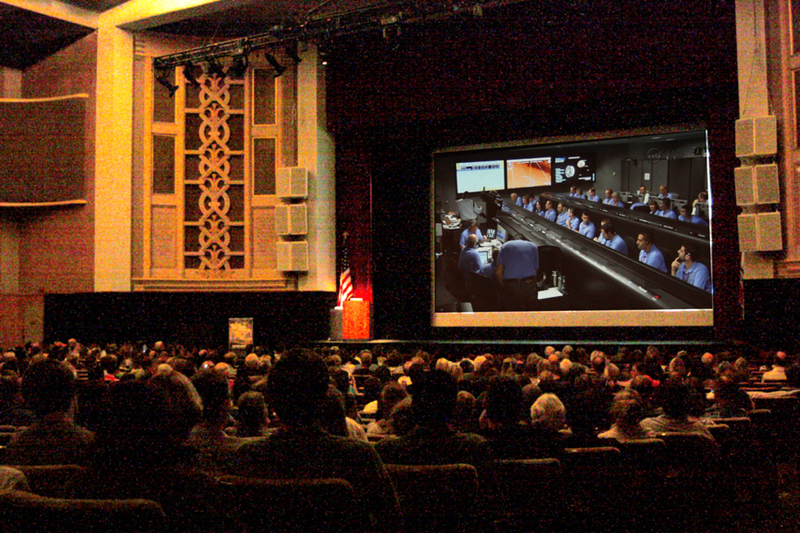 The event was held in the large auditorium at Pasadena City College, just a few miles from JPL where the main events unfolded. Our audience was mostly family members of the MSL team and non-MSL JPL employees, as well as our group of teachers from around the country attending the landing workshop. Many of the people here are well-informed and know people in the control room. I’ve met several of them myself over the last few days and on other occasions when I’ve been to JPL, so as events unfolded, I could say, “There’s So-and-So!” and see the landing as they saw it. There were many venues I could have been at, but I’m glad I was there. I arrived about 8:25 after finding a place to park and grabbed and snarfed the refreshments provided. I found a place along the aisle where my view of the screen would be good. Dave Seidel, Deputy Director of Education for JPL, was our host for the evening. I’ve worked with Dave on workshops for the NASA Explorer Schools program back in 2002-2004, and he has the best combination of technical knowledge, humor, and public speaking ability of anyone I know. He’s a former classroom teacher himself. My notes during the landing of Curiosity on the surface of Mars. I’m in the main auditorium at Pasadena City College watching Dave Seidel explain what will happen as Curiosity lands on Mars. With his usual humor, he’s painting a picture of the technical challenges and covering what we’ll see and hear tonight. 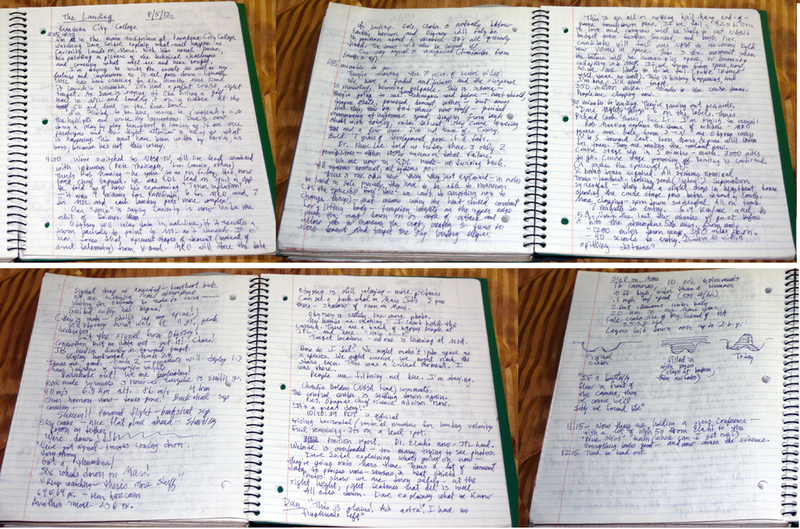 I’m trying to write the events as well as my feelings and impressions as it all goes down – literally. MSL has been cruising for 8 ½ months, ever since it launched in November. It’s had a perfect cruise, right (on) target. As Dave is saying, it’s like hitting a golf ball in NYC and landing it on a Frisbee at the 50 yard line in the Rose Bowl. I’m thrilled to be here, trying to photograph and video the highlights and write my impressions. Dave is now doing a play-by-play description of landing, as if we were passengers and the flight attendant is telling us what is happening. “Don’t worry about the parts falling off of our spacecraft – it’s all perfectly normal” and “You may feel a slight discomfort as we decelerate through 11 Gs.” This may be a bit corny, but it is funny and puts the stresses of landing in human terms. 9:00. We’ve switched to NASA TV, with live feed combined with interviews (Pete Theisinger, Lori Garvin, others). There’s Rob Manning – he spoke to us on Friday. He’s now Chief Engineer. He was EDL Lead on Spirit & Opportunity. He told us of how he’s experiencing “Terror Inflation” – it was 4 minutes for Pathfinder, 6 for MER, and 7 for MSL and each landing gets more complex. Our “voice” is saying Curiosity is now inside the orbit of Deimos. 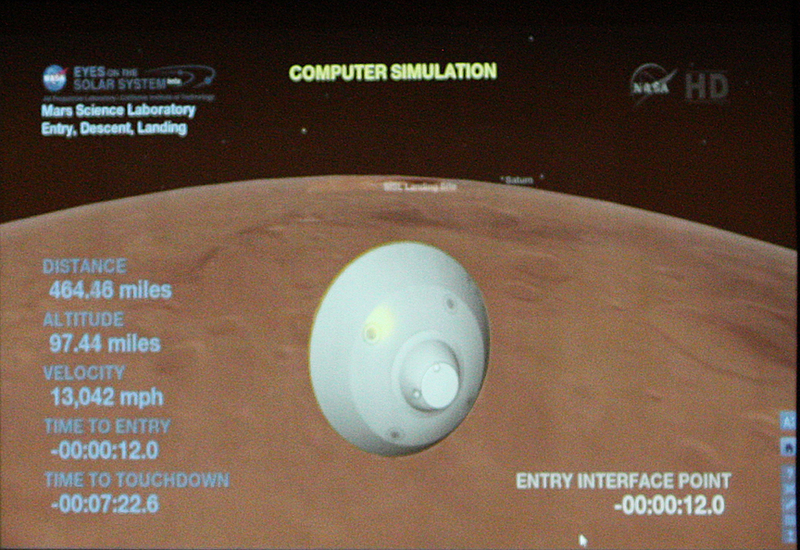 The Seven Minutes of Terror begin: MSL enters Mars’ atmosphere, as seen in this simulation. Odyssey will relay data in real time, if it executes a turn precisely to point to MSL as it descends. It will hear tones that represent stages of descent (instead of direct telemetry) from X-band. MRO will store the data as backup. Gale Crater is actually below Earth’s horizon and Odyssey will only be in position about 5 minutes. It’s all precisely timed. The tones will also be turned off . . . One-way signal is reacquired (transmitter from Earth is off). They’re showing the 7 Minutes of Terror video. We have a packed auditorium and the suspense is mounting, becoming palpable. This is insane – they’re going to use some techniques used before – heat shield, drogue chute, powered descent, tether – but never like this, this big. And there’s new stuff – guided maneuvering at hypersonic speed, dropping from the back shell with dodging, radar descent, sky crane lowering and a few more I’m not sure of. Crazy. Bold. 7 years of development gone if it fails. Dr. Fuk Li told us Friday there (are) only 2 possibilities – either 100% success or total failure. We are now in EDL mode – no turning back. All systems nominal, all systems go. There is one other new thing they just explained – in order to land in Gale precisely, they have to be able to maneuver (or the spaceship itself does – we can’t do anything now to change things) – that means using the heat shield contact for a lifting body – tungsten weights on the upper edge push the craft down on its angle of attack and allow jets to maneuver the craft, creating S-turns to slow descent and target the tiny landing ellipse. This is an all or nothing hail Mary end-of-game touchdown pass; if we fail, $2.6 billion is lost and congress will be likely to cut NASA’s budget even further. Succeed, and both presidential candidates will fall (all) over NASA to announce “bold new visions” in space. This is the moment when the future will be (determined for) humanity in space, or humanity collapsing into itself. If we turn from space now, as we are likely to if we fail, then I doubt we will ever recapture the momentum. Public interest will wane as well as congressional funding. This is history happening, and I’m here – I’ll never forget. 350 million miles – thanks to the cruise team. People are clapping now. They’re passing out peanuts. “Dare Mighty Things” is on the labels. There’s Richard Cook. There’s Fuk Li. I’m trying to remain (calm). Rob Manning is explaining the dance of orbiters – MRO passes over Gale from south to north as Odyssey comes north to south toward the eastern horizon. Even Mars Express will listen for tones. They are venting the coolant now. Cruise stage separation in 5 minutes – mark. 3000 miles to go. Cruise stage powering off. Venting is confirmed (it pushes the spacecraft a bit). X-band tones acquired. All systems nominal. Tones – the heartbeat – looking good (one of the Blue Shirts said, “Whew!” over an open mike). Separation is successful – they had a slight drop in heartbeat tones showing the cruise stage pass between (the) descent (stage) and Earth. More clapping – spin down successful. All on track. 7 minutes to entry. 5.4 km/sec of acceleration growing to 5.9 km/sec. Now’s the last few minutes of quiet before it hits the atmosphere 5 minutes from now. Signal drop as expected – heartbeat back. We are entering Mars’ atmosphere. Waiting for Odyssey to make its turn . . . .
(This is nuts – chills up my spine!) Will Odyssey turn? We’re at 11 Gs, peak deceleration. Got the signal from Odyssey! Connection but no data yet – got it! Cheers! It’s headed directly in toward target. 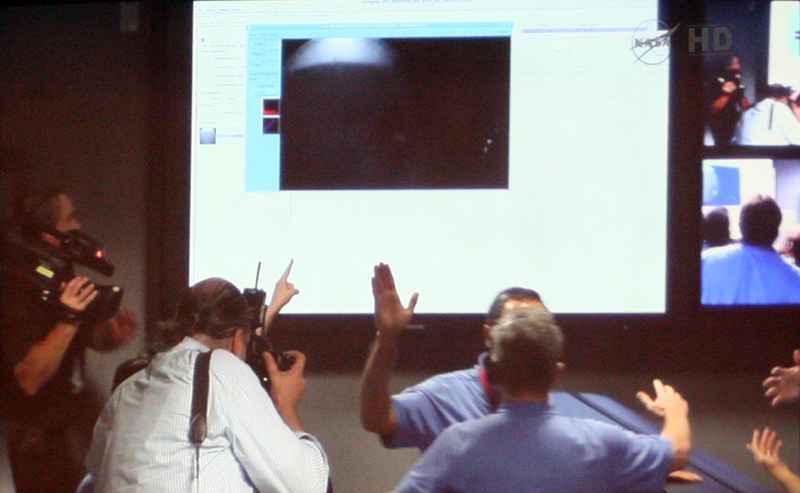 The moment of landing, at JPL and at Pasadena City College. Flying horizontally at Mach 2.4. Tones are good. Mach 2 – parachute will deploy at 1.7 . . . mass jettison of tungsten weights . . .
Parachute out! We are decelerating! “Risk mode dynamics is nominal.” Everyone is smiling. We’re halfway there. 90 m/sec, 6.5 km altitude. Now 8.6 m/s, 4 km up. Over the horizon now – tones gone. Backshell separation is coming . 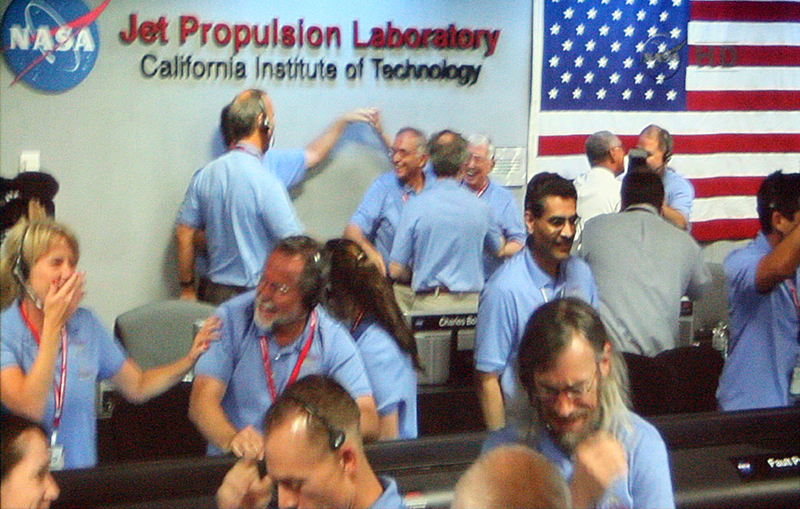 . .
Dr. Charles Elachi, Pete Theisinger, and other “Blue Shirts” celebrate the landing. Success!! Powered flight – backshell separation, skycrane starting – nice flat place ahead – starting down on tether . . . 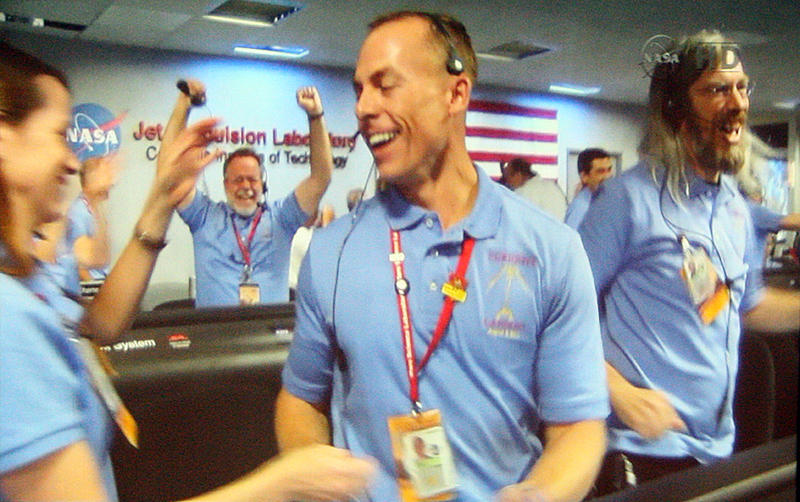 Rob Manning (in background) and other members of JPL’s blue shirt team celebrate the landing. We’ve got signal – images coming down. Very strong. Got a thumbnail! Six wheels down on Mars! “Keep watching – there’s more stuff” The thumbnail is 64 x 64 pixels – from the rear hazcam. Another image – 256 px. Odyssey is still relaying – more pictures. Can see a back wheel on Mars. It’s 3:00 pm there – shadow of the rover on Mars. Odyssey is setting. One more photo. The first thumbnail photo sent by Curiosity from the surface of Mars. My hands are shaking – I can’t hold the camera. There are a bunch of happy people at JPL and here. The controller is trying to give the actual target location – no one is listening at NASA. How do I feel? We might make it into space as a species. We might survive, we might reach the stars even. This was a critical moment. I was there! People are filtering out here. I’m staying. Charlie Bolden (NASA head) makes comments. The control center is settling down again. Pres. Obama’s chief science advisor now. “It’s a great day!” 10:40:39 is the official time of landing. They’re giving horizontal and vertical numbers for landing velocity, fuel remaining. It’s on a level spot. Position report. Dr. Elachi now – JPL head. Website is overloaded – too many people trying to see the photos. Dave Seidel explaining what’s going on now – they’re going onto Mars time. There’s a lot of descent data to process now (recorded by) sensors in the heat shield. Photos show we are down safely, at the right height, right features showing in the shadows tell us that all is well. All the websites are down now. Dave is explaining what we know so far. 11:15 now. They are holding a press conference, with a lot of high fives from Elachi to the “Blue Shirt” team (where can I get one?). It takes five minutes to quiet everyone down. Everything looks good. And now comes the science. 12:15. Time to head back to the motel. Let me end with some impressions after the fact. The rush of events was so fast I barely had the time to write them down, let alone how I felt at the time. I remember thinking that this was better than any Hollywood movie (and cost each taxpayer about the same amount, as Dr. Holdren pointed out). This was real suspense, real lives on the line (in terms of the seven years of hundreds of lifetimes spent on this, it really does amount to the equivalent of several lives). And as each milestone was reached, we all cheered and clapped along with the engineers on the EDL team. All of us, the scientists and engineers at JPL and everyone in the auditorium (and in Times Square and at many places around the globe), rode with Curiosity down to the surface of Mars. In my notes I keep saying (as did the voice of control) that “we” are doing this or that. The rover was part of us and we were part of it and we all landed on Mars together. 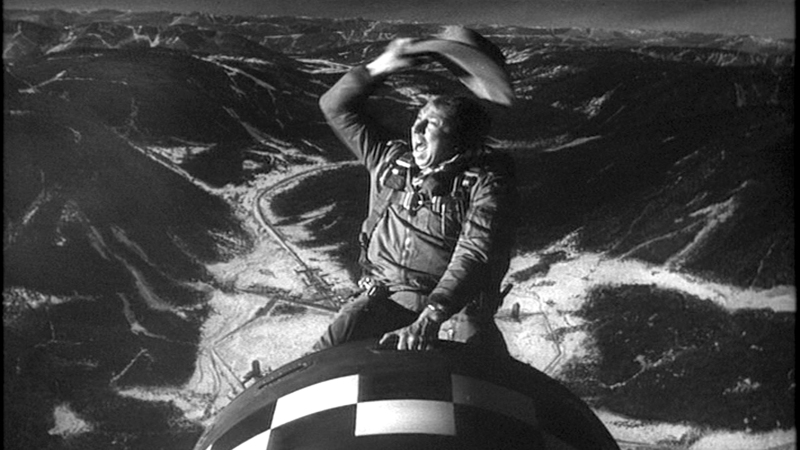 It reminded me of the infamous scene in Dr. Strangelove, where Slim Pickens rides the hydrogen bomb down. Except this time we didn’t blow up. I felt like yelling “Yeehaw!” myself as we were landing. This is a human achievement equivalent to the Moon landings, the Hubble Telescope and its repair missions, and the building of the ISS as the greatest engineering triumphs of our time. Hundreds of things had to happen at exact times. They all worked. All of them. If the President (whoever he winds up being) and congress turn their backs on this success by gutting NASA and the space program, then they will have betrayed our future, and I’ll give them a piece of my mind. I’ve made a promise to myself to do whatever I can to get humanity to Mars and into the rest of the solar system. I fulfill that promise as an educator, by teaching the next generation of scientists and engineers, but there is always more I could do, such as writing letters to my congresspersons encouraging them to continue funding these types of bold endeavors. Maybe NASA doesn’t need to be in the space taxi business. Maybe private companies can fill the void by providing launch systems. But they never would have if NASA hadn’t gotten us into space and created a market in the first place. Someday maybe space will hold its own and make a profit for private business, but that day is still a ways off (I think 50 years but that probably means it will be about 10). One thing for certain, this landing proved we can still do it and gave us space geeks a much needed shot in the arm. History will tell if we choose to grasp or to miss this opportunity. I also notice how all of the scientists and engineers I’ve heard from over the last three days were all inspired to follow a career path into space science by watching previous missions when they were children, such as the Apollo landings (like me) or the Viking landings in 1976. Seeing these successes has an incalculable impact on the students who watch them. How many budding scientists will now continue into science careers because of what happened tonight? We’ve got to encourage that, and keep exploring, if our society is to survive. It was a glorious night, a night to dare mighty things. A night to remember. This entry was posted in Uncategorized and tagged curiosity, curiosity rover, edl, entry descent and landing, gale crater, jet propulsion laboratory, jpl, mars, mars exploration, mars rover, rover. Bookmark the permalink. We are students at Weber State University, we are currently writing an article on the Mars Rover. We would like to be able to use you as one of our interviews. If you could please email us that would be great. Please get back to us as soon as possible. Thanks.